VST manufacture and direct selection methodology. VSTs can be generated by coculture of virus-derived peptides, proteins, or viral lysates with antigen-presenting cells (APCs) and T cells. However, these techniques are time-consuming and difficult to reproduce to good manufacturing practice (GMP) standards. Recently developed coculture methods include the use of gene-modified APCs that are engineered to present immunogenic viral peptides to T cells. This may allow for the generation of virus-reactive T cells from virus-naive donors. Direct selection techniques can permit rapid generation of VSTs to GMP standards and are now being used in clinical trials. Selection is delivered through IFN-γ capture or through multimer-based selection. 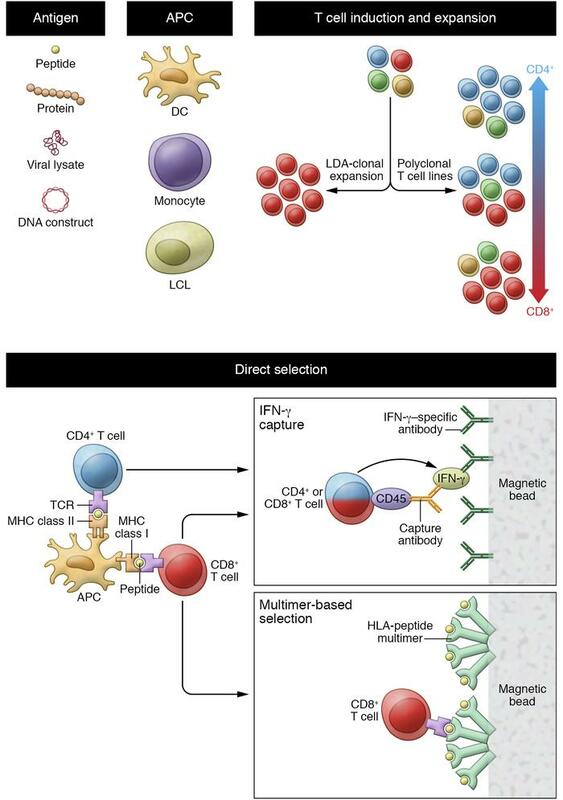 LCL, lymphoblastoid cell lines; MoDC, monocyte-derived dendritic cell; LDA, limiting dilution assay.